San Francisco is known for sightseeing, nature, museums, historic sites, and parks. 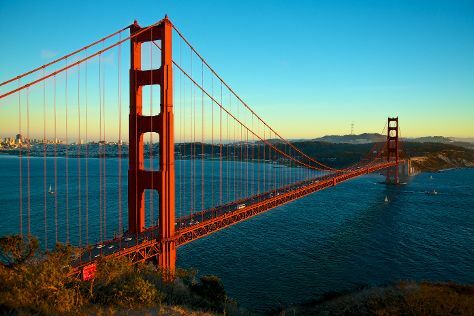 Your plan includes some of its best attractions: take in the views from Golden Gate Bridge, take a memorable ride with Cable Cars, wander the streets of Fisherman's Wharf, and steep yourself in history at Alcatraz Island. To see reviews, photos, more things to do, and tourist information, read our San Francisco trip generator. Los Angeles to San Francisco is an approximately 4-hour combination of train and flight. You can also drive; or take a bus. Traveling from Los Angeles in June, expect San Francisco to be a bit cooler, temps between 71°F and 55°F. Finish your sightseeing early on the 28th (Wed) to allow enough time to drive to Mendocino. Mendocino is an unincorporated community in Mendocino County, California, United States. Step out of Mendocino to go to Point Arena and see Schooner Gulch State Beach, which is approximately 56 minutes away. And it doesn't end there: cruise along Mendocino Coast, steep yourself in history at Ford House Visitor Center & Museum, enjoy the sea views from Point Cabrillo Light Station, and take in nature's colorful creations at Mendocino Coast Botanical Gardens. To find where to stay, photos, more things to do, and more tourist information, refer to the Mendocino itinerary maker. Traveling by car from San Francisco to Mendocino takes 3.5 hours. Alternatively, you can take a bus. Traveling from San Francisco in June, expect nights in Mendocino to be about the same, around 53°F, while days are a bit warmer, around 86°F. Finish up your sightseeing early on the 1st (Sat) so you can travel back home.